In December 2014, the British House of Commons voted to intervene militarily with targeted airstrikes in Syria, and the United Kingdom (UK) embarked on a new phase in addressing the expansion and role of the Islamic State (ISIS). Hilary Benn, the UK’s Shadow Foreign Secretary made a speech highlighting the threat ISIS poses to the UK and liberal democracy. Yet, the UK and other democratic states have increasingly engaged in policy actions at home that threaten liberal democratic ideals, including expanded citizenship revocation. Citizenship revocation or deprivation refers to all legal arrangements for the involuntary loss of citizenship or nationality. International law guarantees states the right to determine nationality/citizenship, providing a basis for inclusion and exclusion. Conversely, due to the rise of statelessness during the twentieth century, international legal agreements and norms have shifted in an attempt to reduce statelessness and promote human rights. While this may be the case, the largely liberal and broad international legal environment has produced wide variations in citizenship revocation policies. According to the Constitute Project, 130 state constitutions include legal language that outlines citizenship revocation. Many states include a legal chapter, article, act, or clause that outlines particular actions that may warrant citizenship revocation and illuminates the state powers that authorize this act. Additionally, some constitutions include legal clauses, chapters, articles, or acts that outline a state’s inability or lack of authority to revoke citizenship. While not all states have constitutional provisions related to revocation, many states have other extra-constitutional revocation laws and policies. For example, as of 2014, 33 European states have laws or policies stipulating legal grounds for loss of citizenship. Additionally, 22 states have laws dictating grounds for revocation related to specific activities that directly or indirectly contravene state interests. Citizenship revocation has been linked to the post-9/11 expansion of state security measures and has been justified as a necessary tool to prevent terrorist acts. From a national security perspective, revocation is a counter-terrorism response that can reduce the likelihood of transnational terrorist attacks. Counter-terror responses are seen as necessary, particularly since the estimated number of ISIS foreign fighters reached over 20,000 and included citizens from Western Europe (includes UK) (4,000), US (100), Canada (100), Australia (100-250), Saudi Arabia (1,500-2,500), Tunisia (1,500-3,000), Morocco (1,500), Jordan (1,500), Lebanon (800), and Turkey (600). These fighters are often trained and experienced in specific tactics or skills associated with terrorism. According to Macklin (2015), “that states can treat noncitizens in ways they cannot lawfully treat citizens incentivized states to exploit migration law to pursue counterterrorism objectives post-9/11.” While citizenship revocation is not entirely new, citizenship revocation’s expansion in light of transnational terrorism is new. The purpose of this comparative report is to reflect on the expansion of citizenship revocation and provide the public with a better understanding of this international citizenship policy trend. The report includes narrative descriptions highlighting revocation laws in context and includes some case examples. The authors of this paper conducted research on citizenship revocation in the UK, Canada, and Australia. The following findings and recommendations from their research are based on pertinent contemporary research on citizenship revocation and data/information gathered through freedom of information requests. Recent actions taken by the Australian, Canadian, and UK governments illustrate a troubling trend towards the expansion of citizenship revocation against its own citizens in response to transnational terrorist threats. The military conflicts in Syria and Iraq against the Islamic State, the migration crisis to which they have contributed, and ISIS-inspired and -supported attacks elsewhere have led to growing pressures, fears, and policy responses. As terrorist threats are increasingly recognized as neither national nor international, but transnational, these three governments, among others, have taken undemocratic steps towards promoting security through decreasing the protections of their citizens with a particular inequitable emphasis on non-native-born citizens. By revoking citizenship and all related rights of confirmed or suspected threats to national security, these three governments are increasing the stateless or semi-stateless population and altering what it means to be a citizen in their liberal democracies. Of these three states, Canada alone has sought to rectify its citizenship revocation policy, which included a tiered citizenship policy and a revocation policy aimed at preventing terrorist threats, by amending its Harper-era (2006-2015) legislation. In 2006, the Howard government, in power from 1996-2007 and led by Prime Minister John Howard of the center-right Liberal Party, began discussing the potential of enacting revocation legislation in relation to recent acts of terrorism. The Howard government lost power in the 2007 elections however, and so revocation legislation discussions did not translate into state practice until the Liberal-National coalition retook power in 2013, led by Tony Abbott, a senior minister in the Howard government. Following Abbott’s election, his government began implementing tough anti-terrorism and security-oriented legislation. In 2014, his government pushed forward legislation including the controversial National Security Legislation Amendment Act (NSLAA). Although security legislation was enacted, citizenship revocation policy did not pass until after a major terrorist incident in December 2014, which saw Iranian-born Man Haron Monis take 18 hostages for 16 hours in a Sydney Lindt chocolate cafe, leaving 3 dead, including Monis. While the exact role of ISIS in this attack is still open to interpretation, the attack contributed to growing fears and the security orientation of the Australian government’s migration and citizenship policies. Even prior to the incident, the Australian state voiced alarm at the estimated number of Australian citizens and residents fighting for ISIS in Iraq and Syria, which propelled the Australian government (ASIO) to cancel suspected terrorists’ passports, preventing them from legally returning to Australia. The incident also blends with Australia’s broad legal definition of terrorism, which emphasizes intentionality and ideology. Nearly a year after Australia’s first major occurrence of terrorism linked to ISIS, the Australian state, “passed new laws…giving the government power to revoke the Australian citizenship of some people with dual nationality if it suspects they may be engaging in terrorism, even if the people have not been charged with any crime.” In December 2015, the Australian government passed the Australian Citizenship Amendment (Allegiance to Australia) Act 2015 (“the Act”). Although the law remains controversial, the Australian government perceives the law as a necessary response to contemporary forms of terrorism. The Act “recognises that Australian citizenship is a common bond, involving reciprocal rights and obligations, and that citizens may, through certain conduct incompatible with the shared values of the Australian community, demonstrate that they have severed that bond and repudiated their allegiance to Australia.” It defines: (1) the Australian state’s ability to revoke citizenship; (2) a citizen’s actions that may warrant revocation; (3) legal procedures for revoking citizenship; and (4) to whom revocation may apply. It applies to dual citizens, regardless of how they obtained Australian citizenship, whether by birth, naturalization, or other means (e.g., marriage). Additionally, the Act applies to individuals as young as 14 years of age and provides that once citizenship is revoked, there will be no chance of re-naturalization. According to the Act, citizenship revocation may apply to individuals who engage in an array of activities that are legally understood to be national security threats. Individuals with dual citizenship who engage in such acts renounce their citizenship “by conduct.” This means that if an individual does something that equates to terrorism or an act against the state, he or she effectively renounces citizenship. According to the Act, “a person who is a national or citizen of a country other than Australia renounces their Australian citizenship [emphasis on dual nationals] if the person acts inconsistently with their allegiance to Australia.” While there are eight specified activities or actions that warrant revocation, each is related in some way to terrorism. These include, but are not limited to engaging in armed military-like activities with a declared enemy state or terrorist organization outside of Australia and conviction of terrorism and other criminal offenses. The Act remains controversial and because it is relatively new (2015), there is limited scholarship on the law and its immediate impacts on Australians or its implications for the Australian legal landscape. Prior to the Act’s enactment, between 1948 and mid-2015, only 16 individuals had their citizenship revoked by the government based on older legislation (Sales, 2015). Since its enactment in December 2015, there has been only one example of citizenship revocation. As of 2017, the Turnbull government continued to push this policy forward and is attempting to make it even more difficult to obtain citizenship through naturalization. Unfortunately, there is a global industry of unscrupulous, unethical immigrant and citizenship agents posing as bona fide consultants, who will sell people advice on how to scam the Canadian system…We’re here today once again to say that Canadian citizenship is not for sale…This is something that was taken on with vigor by the Royal Canadian Mounted Police and the Canada Border Services Agency when we asked that they prioritize fraud in our citizenship program. So, starting three years ago, they launched major criminal investigations and they’ve discovered that individuals pay upwards of $25,000 over four or more years to maintain the illusion of residence in Canada. According to Minister Kenney and the Harper government, citizenship fraud was becoming endemic and required new policies, including revocation expansion. Although revocation expansion was primarily linked to suspected fraud, the focus shifted to security and terrorism during Harper’s tenure as PM. In 2013, a Conservative Canadian MP and Minister Kenney, attempted to alter citizenship revocation by emphasizing “that a Canadian citizen who commits certain designated acts, ‘is deemed to have an application for renunciation of their Canadian citizenship.’” While this initial attempt was defeated, a similar interpretation of revocation was enacted in 2014 under C-24. C-24 itself was a robust and detailed law that outlined a tiered citizenship and citizenship revocation system. According to C-24, citizenship revocation (or renunciation on the basis of illegal or criminal actions) applies to: (1) individuals obtaining citizenship by fraud or false representation; (2) all dual citizens, retroactively (before and after C-24); (3) individuals engaged in treasonous activities; (4) convicted terrorists; (5) and convicted traitors or individuals convicted of committing other serious national security offenses, as defined under the National Defence Act and/or Security of Information Act. Additionally, like Australia’s equivalent revocation Act, C-24 targeted dual citizens. By creating laws specifically designed for dual citizens, this policy has also created a tiered citizenship system in which dual citizens (which are primarily immigrants and ethnic or racial minorities) are subject to differentiated and inequitable laws. Canada’s Strengthening Canadian Citizenship Act – which was amended in June 2017 under Bill C-6 – was controversial during its brief lifespan. Additionally, while the Trudeau government spoke against C-24, citizenship revocation cases actually rose under Trudeau. Although we were unable to receive citizenship revocation numbers or cases through our government information requests, according to a 2016 CBC report, between June 2014 and August 2016, there were 242 revocation cases; the majority of which occurred under the Trudeau government. Additionally, 312 revocation cases under the purview of the Canadian Federal Court were declared void because under the original language of the 2014 Strengthening Canadian Citizenship Act, individuals were not provided a fair oral hearing and, “did not take into account humanitarian and compassionate considerations.” The number of voided cases reveals the extensive impact of expanded citizenship revocation in Canada. While the Strengthening Canadian Citizenship Act has since been amended, the sheer numbers of cases during this short legal window illustrates the precedence and lasting damage revocation policies can cause. The United Kingdom has a more robust legal precedence and practice of citizenship revocation than Australia or Canada. The ability to revoke or deprive individuals of their British citizenship, or effectively banish them from the UK without full, legal revocation, can be found in a number of legal instruments including historic and contemporary laws, which include the British Nationality and Status Act of 1914, British Nationality Act 1981, Immigration and Asylum Act 1999, Nationality, Immigration and Asylum Act 2002, Immigration, Asylum and Nationality Act 2006, the Counter-Terrorism and Security Act 2015, and the Immigration Act 2014. Current UK citizenship revocation laws and practices emanate from the British Nationality Act (BNA) 1981 (enacted in 1983, but subsequently amended in accordance with the additional aforementioned Acts), which states that citizenship may be revoked if the legal action is conducive to the public good without rendering said individual stateless or the individual acquired their citizenship through fraudulent means. Additionally, the BNA 1981 also stipulates that the Home Secretary has the power, “to deny or revoke passports when this is considered to be in the national interest,” through what is known as the Royal Prerogative (power that does not require legislative process or action). The UK has expanded its citizenship revocation laws and practices since the passage of the BNA. However, revocation was seldom utilized until the BNA 1981 was amended with the Nationality, Immigration and Asylum Act 2002 (NIAA 2002), which broadened the application of revocation to acts that are “seriously prejudicial to the vital interests of the UK or a British overseas territory” and to citizens by birth. Concurrent to the passage of the NIAA 2002, the UK government was also ratifying the 1997 European Convention on Statelessness. In doing so, the UK government cemented its international and EU obligations to prevent statelessness. The ratification of the 1997 Convention ensured that revocation powers could only be applied to those with dual citizenship. Thus, foreign-born naturalized citizens tend to be the primary target population. Following the 2005 London terrorist bombings and other high-profile cases involving dual citizens who were charged with promoting or supporting terrorist activities, the UK government again altered its citizenship policies. The Immigration, Asylum and Nationality Act (IANA) 2006 expanded the UK Home Secretary’s ability to engage in citizenship revocation. Although terrorism is not explicitly linked to revocation in the IANA 2006, its vague and open-ended language – “deprivation is conducive to the public good” – expands the actions that can be deemed sufficient for revocation. With the emergence of new terror threats, the Islamic State, and European migration crisis, the UK has subsequently amended its citizenship revocation laws through the Counter-Terrorism and Security Act 2015 and the Immigration Act 2014. Both laws are directly connected to growing fears of UK citizens that are foreign fighters of the Islamic State and other terrorist groups training, fighting, and returning to the UK. The Immigration Act 2014 includes 77 clauses and builds upon prior legislation. Notable components attempt to make illegal immigration more difficult by outlining expulsion processes, increasing penalties and denial of basic services (including identification documents, bank accounts, housing, healthcare, legal appeals) to unauthorized immigrants. It is not right that a person who has acquired British citizenship – and accepted the rights, responsibilities and privileges that derive from this – can act in a way that threatens the security of the UK and retain British nationality simply because they may be left stateless as a result of deprivation. We are changing this for a small sub-category of cases even if such action left them stateless. Thus, the UK government under the guidance of then Home Secretary and current Prime Minister Theresa May can now revoke citizenship from dual and non-dual nationals that have, “conducted him or herself in a manner which is seriously prejudicial to the vital interests of the United Kingdom, any of the Islands, or any British overseas territory.” As Home Secretary, May used citizenship revocation as a legal tool against suspected terrorists. While revocation cases may be more likely among dual nationals, those individuals who maintain only UK citizenship through naturalization are the most vulnerable, as their cases could lead them to statelessness. Although the UK government revoked approximately 42 UK citizens of their citizenship between the enactment of the 2006 Act and the enactment of the Immigration Act 2014, this newer act expands the UK government’s ability to engage in revocation on a scale unprecedented in modern times. While the UK government notes that the revocation cases would be rather small and that the Home Secretary’s power would be monitored, the Act’s language highlights that dual citizenship and statelessness can be sacrificed in response to the threat of terrorism. The heightened fear of foreign fighters, particularly in the wake of the Islamic State territorial expansion and the 2015 Paris terrorist attacks, propelled the UK government to again increase its revocation powers. The Counter-Terrorism and Security Act 2015 (passed in 2014 and enacted in 2015 via Royal Assent) provides the UK government the power to, “disrupt the ability of people to travel abroad to engage in terrorist activity and then return to the U.K.” Both the Immigration Act 2014 and Counter-Terrorism and Security Act 2015 remain highly controversial, as some claim that these Acts undermine UK democracy, transparency, and citizenship. 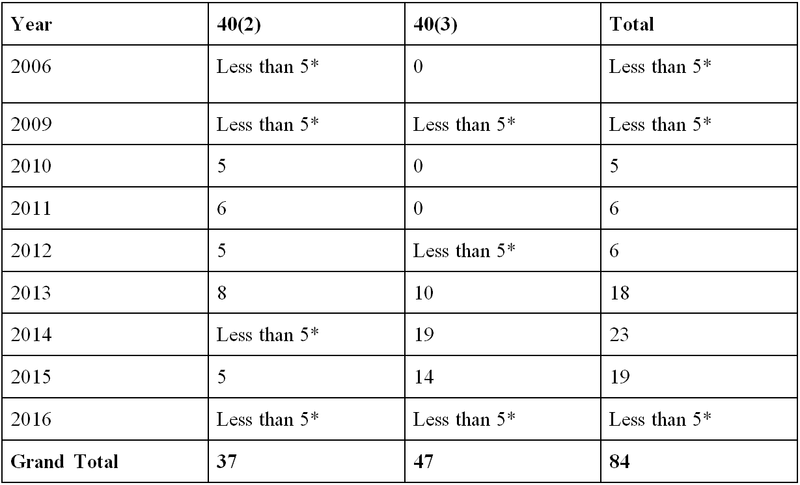 Following a freedom of information data request, we were able to obtain the number of 40(2) (revocation for the “public good”) and 40(3) (revocation for fraud, false representation or concealment of a material fact) cases from the UK Visas and Immigration Home Office, included in the table below. A brief glance at the data demonstrates that the number of cases notably increased during the 2013-2016 period, coinciding with the passage of the Immigration Act of 2014, and the Counter-Terrorism and Security Act of 2015, both of which expanded citizenship revocation authorities. The enactment of these problematic provisions highlights securitizing shifts within the UK government and population, which may have broader impacts on other Commonwealth legal systems and practices. Citizenship revocation expansion is a growing and troubling trend that requires immediate attention, particularly from policy-makers and human rights’ advocates. While historical precedence exists for revocation, particularly in relation to fraud or treason, revocation is expanding in light of growing fears and threats of transnational terrorism. Such fears and threats may be warranted, especially in countries that have witnessed horrific attacks; however, governments and citizenries alike should be cautious of using such fears and threats to alter citizenship policy. While Australia, Canada, and the UK have different revocation policies and contexts, and Canada recently amended its policy altogether as of June 2017, they share similarities, including: (1) an emphasis on terrorism or terrorist-related activities; (2) the provision of extensive legal and decision-making powers to a government minister(s); (3) “renunciation” of citizenship through individual actions (like an act of terrorism); and (4) the targeting of dual citizens, thus rendering the denaturalized stateless, bypassing international human rights’ agreements related to statelessness, and targeting ethnic, racial, and religious minorities. International human rights groups, advocates, scholars, and policy-makers alike must keep a watchful eye on citizenship revocation policies and their impacts, through: (1) active monitoring of legal changes and policy implementation; (2) attention and awareness of shifts in political or legal rhetoric, specifically if security or fear of threats are conflated with citizenship or nationality; (3) critical interdisciplinary research; (4) collaboration among the aforementioned groups; (5) advocacy for minority communities inequitably impacted; (6) legislative or legal action; and (7) recognition of and advocacy for alternative policies or approaches. Such efforts are already underway, including at the Institute on Statelessness and Inclusion in The Netherlands and European Union Democracy Observatory on Citizenship, both of which provide innovative research and some monitoring of revocation. However, substantial gaps remain within research and other potential efforts. Citizenship revocation, regardless of its application, is a dangerous legal tool that threatens the human rights, social cohesion, legal equality, and unconditional citizenship. By revoking an individual’s citizenship, his or her rights are also revoked and the individual is often left in a legal limbo, potentially stateless, or even deported to a country with which she or he have at best tenuous connections. Australia, Canada, and the UK (among other states) should rethink their citizenship revocation initiatives and how they devalue citizenship within their national communities. While national contexts and legal systems vary, states impacted by ISIS returnees are engaging in a variety of programmatic and policy interventions aimed at mitigating potential security threats. Recent research suggests that approaches vary, with some states opting for “hard” approaches that emphasize prosecution and punishment (like revocation, deportation, arrest, and imprisonment) and others opting for “soft” approaches (fall under the notion of countering violent extremism (CVE)) that focus on a mix of prevention (like counter-narratives in media, community programs, and providing greater social and economic stability for at-risk communities or groups) rehabilitation (deradicalization), and reintegration. The success or effectiveness of soft approaches tend to be mixed, often depending on the context, policy, program, and even individual returnee. Additionally, although “hard” approaches tend to be popular among the public and politically-motivated officials, they also tend to have negative consequences, including increasing social instability within communities, enhancing the success of terrorist recruitment, and continued radicalization during imprisonment. According to a 2014 Brookings Institution report on foreign fighter returnees, “Harsh steps are at times necessary, but they must be applied gingerly or else they may backfire.” Citizenship revocation is an extreme harsh step, that could be replaced with alternative “hard” or “soft” approaches or policy measures aimed at security and reducing terrorist threats, while simultaneously ensuring democratic citizenship for all citizens. Dr. David J. Trimbach is a geographer and postdoctoral research associate in the Department of Fisheries and Wildlife at Oregon State University. His research focuses on human-environment interactions, citizenship, identity, sense of place, and governance. He is a community-engaged scholar that seeks to inform public policy. Dr. Nicole Reiz holds a doctorate in Geography. Her research focuses on geopolitics and legal geography. Her current research explores the legal arrangements of visiting military forces. Nicholas Watt, “Hilary Benn makes emotional plea for Britain to bomb Isis ‘fascists’ in Syria,” The Guardian, December 2, 2014, http://www.theguardian.com/world/2015/dec/02/william-hague-breaks-with-cameron-over-use-of-ground-forces-in-syria. In British politics, the opposition party or the party not in power has a shadow cabinet. Within the shadow cabinet, there are numerous positions such as Shadow Foreign Secretary or Shadow Secretary of State for Defence. In practice, these individuals are appointed to question and challenge the views and politics of their counterparts in the Cabinet. Rainer Bauböck and Vesco Paskalev, “Citizenship Deprivation A Normative Analysis,” CEPS Papers in Liberty and Security in Europe, March 2015, https://www.ceps.eu/system/files/LSE82_CitizenshipDeprivation.pdf. Kay Hailbronner, “Nationality in public international law and european law,” in Acquisition and loss of nationality: Policies and trends in 15 European States ed. Rainer Bauböck, (Amsterdam: Amsterdam University Press, 2006). Craig Forcese, “A Tale of Two Citizenships: Citizenship Revocation for ‘Traitors and Terrorists,’” Queen’s Law Journal 39, no. 2 (2014): 551-70. The Constitute Project is an innovative online archive of the world’s constitutions. The citizenship revocation articles, chapters, or references for all constitutions can be found here: https://www.constituteproject.org/search?lang=en&key=citrev. Gerard Rene de Groot, Maarten Vink, and Iseult Honohan, Loss of Citizenship, (Florence, Italy: European Union Democracy Observatory on Citizenship, 2014). Audrey Macklin, “Sticky Citizenship,” in The Human Right to Citizenship: A Slippery Concept, eds. R. E. Howard-Hassman and M. Walton-Roberts (Philadelphia: University of Pennsylvania Press ). Shiva Jayaraman, “International Terrorism and Statelessness: Revoking the Citizenship of ISIL Foreign Fighters,” Chicago Journal of International Law, 2016, 17 (1): 178-216. Forcese, “A Tale of Two Citizenships”; Matthew Gibney, “Should Citizenship be Conditional? The Ethics of Denationalization,” The Journal of Politics 75, no. 3 (2013): 646-58. The Data Team, “The evolution of the Islamic State,” The Economist, August 12, 2016, https://www.economist.com/blogs/graphicdetail/2016/08/daily-chart-10. The Canadian Press, “Dual Canadian citizens convicted of terrorism will no longer lose citizenship under new bill,” Global News, June 15, 2017, http://globalnews.ca/news/3532646/bill-c6-passes-senate/. National Security Legislation Amendment Act 2014 (Cth.) (Austl.). Michael Safi, “Who was Man Haron Monis? Plenty of intrigue but no clear answers from the Sydney siege inquest,” The Guardian, June 4, 2015, http://www.theguardian.com/australia-news/2015/jun/05/who-was-man-haron-monis-plenty-of-intrigue-but-no-clear-answers-from-the-sydney-siege-inquest. Simon Benson, “Australia goes into terror lockdown: Spy agencies and customs will lock down borders to potential jihadists,” The Daily Telegraph, June 19, 2014, http://www.dailytelegraph.com.au/news/nsw/australia-goes-into-terror-lockdown-spy-agencies-and-customs-will-lock-down-borders-to-shypotential-jihadists/news-story/4d94741e343c799a3bebb4129ee86c58?=. National Security Legislation Amendment Act 2014 (Cth.) (Austl. ); Fergal Davis, “Man Haron Monis: terrorist or deranged lunatic?” The New Daily, August 25, 2015, http://thenewdaily.com.au/news/2015/08/25/doubt-terrorist-attack/. Michelle Innis, “Antiterror Laws Empower Australia to Act Against Dual Citizens,” The New York Times, December 3, 2015, http://www.nytimes.com/2015/12/04/world/australia/antiterror-laws-empower-australia-to-act-against-dual-citizens.html?_r=0. Vishakha Sonawane, “Australia Passes Law To Strip Terror Convicts Of Citizenship,” International Business Times, December 4, 2015, http://www.ibtimes.com/australia-passes-law-strip-terror-convicts-citizenship-2211276. Australian Citizenship Amendment (Allegiance to Australia) Act 2015 (Cth) (Austl.). Leigh Sales, “Not making someone stateless ‘most important’ says Peter Dutton on terrorism-related laws,” Australian Broadcasting Corporation, June 1, 2015, http://www.abc.net.au/7.30/content/2015/s4246600.htm. Rayner Thwaites, Report on Citizenship Law: Australia (Florence, Italy: European Union Democracy Observatory on Citizenship, 2017); Jane Norman and Caitlyn Gribbin, “Islamic State fighter Khaled Sharrouf becomes first to lose citizenship under anti-terror laws,” Australian Broadcasting Corporation, February 10, 2017, http://www.abc.net.au/news/2017-02-11/islamic-state-fighter-khaled-sharrouf-stripped-of-citizenship/8262268. Gareth Hutchens, “Peter Duttton pressures Labor to support Coalition’s citizenship crackdown,” The Guardian, June 11, 2017. John Barber, “Canada’s Conservatives create ‘barbaric cultural practices’ hotline,” The Guardian, October 2, 2015, http://www.theguardian.com/world/2015/oct/02/canada-conservatives-barbaric-cultural-practices-hotline. Minister Jason Kenney, “Speaking notes for The Honourable Jason Kenney, P.C., M.P. Minister of Citizenship, Immigration and Multiculturalism,” Government of Canada, September 10, 2012, http://www.cic.gc.ca/english/department/media/speeches/2012/2012-09-10.as. Audrey Macklin, “Citizenship Revocation, the Privilege to Have Rights and the Production of the Alien,” Queen’s Law Journal 40, no. 1 (2014): 1-54. Michelle McQuigge, “Citizenship law Bill C-24 challenged as unconstitutional by civil rights groups,” The Global and Mail, August 20, 2015, https://www.theglobeandmail.com/news/national/citizenship-law-bill-c-24-challenged-as-unconstitutional-by-civil-rights-groups/article26032727/. Steven Chase, “Harper says ‘moderate Muslims’ support view of niqab ban,” The Globe and Mail, March 11, 2015, http://www.theglobeandmail.com/news/politics/harper-says-majority-of-moderate-muslims-support-view-on-niqab-ban/article23413872/; Tamara Micner, “How a Canadian Expat Lost the Right to Vote from Abroad,” The Wall Street Journal, October 9, 2015, http://blogs.wsj.com/expat/2015/10/09/how-a-canadian-expat-has-lost-the-right-to-vote-from-abroad/. Shafiq Qaadri, “The Harper government’s attack on citizenship,” The Star, November 3, 2014, http://www.thestar.com/opinion/commentary/2014/11/03/the_harper_governments_attack_on_citizenship.html. Forcese, “A Tale of Two Citizenships”; Omar Ha-Redeye, “Born in Canada, Not a Citizen, But No Place to Go,” Slaw: Canada’s Online Legal Magazine, December 11, 2016, http://www.slaw.ca/2016/12/11/born-in-canada-not-a-citizen-but-no-place-to-go/. Forcese, “A Tale of Two Citizenships”; Ha-Redeye, “Born in Canada, Not a Citizen, But No Place to Go”; Charlie Smith, “Liberal government plans to scrap two-tier citizenship,” The Georgia Straight, November 7, 2015, http://www.straight.com/news/573696/liberal-government-plans-scrap-two-tier-citizenship; Somayeh Bahrami, “Critical Review of the New Canadian Citizenship Law Bill C-24,” Bilingual Comment, February 26, 2016, http://www.sfu.ca/education/cels/bilingual/bilingual-corner/bill-c-24.html; The Canadian Press, “Dual Canadian citizens convicted of terrorism will no longer lose citizenship under new bill,” Global News, June 15, 2017, http://globalnews.ca/news/3532646/bill-c6-passes-senate/. Evan Dyer, “Trudeau government revoking citizenship at much higher rate than Conservatives,” Canadian Broadcasting Corporation (CBC), October 9, 2016, http://www.cbc.ca/news/politics/citizenship-revocation-trudeau-harper-1.3795733. Tu Thanh Ha, “Federal Court voids Canadian citizenship revocation for 312 people,” The Globe and Mail, July 12, 2017, https://www.theglobeandmail.com/news/national/federal-court-voids-canadian-citizenship-revocation-for-312-people/article35675424/. Matthew Gibney, “‘A Very Transcendental Power’: Denaturalisation and the Liberalisation of Citizenship in the United Kingdom,” Political Studies 61, no. 3 (2013): 637-55; Forcese, “A Tale of Two Citizenships”; Melanie Gower, “Deprivation of British Citizenship and Withdrawal of Passport Facilities,” House of Commons Library, January 30, 2015, http://researchbriefings.parliament.uk/ResearchBriefing/Summary/SN06820; Shai Lavi, “Citizenship Revocation as Punishment: On the Modern Duties of Citizens and Their Criminal Branch,” University of Toronto Law Journal 61, no. 4 (2011): 783-810; Lee Jarvis and Michael Lister, Anti-terrorism, Citizenship and Security (Oxford: Oxford University Press, 2015). British Nationality Act 1981, § 40 (Gr. Brit.). The terrorist attacks that occurred in July 7, 2005, included four suicide bombings in London on public transportation that killed 52 and injured 920 people. Weeks later on July 21, 2005, three additional attacks on public transportation occurred in London, injuring 1 person. See Ian Cobain, “London bombings: the day the anti-terrorism rules changes,” The Guardian, July 7, 2010, https://www.theguardian.com/uk/2010/jul/07/london-bombings-anti-terrorism; Mark Oliver and James Sturcke, “Panic as London is hit again,” The Guardian, July 21, 2005, https://www.theguardian.com/uk/2005/jul/21/july7.uksecurity2. The IANA 2006 added language to the British Nationality Act 1981, section 40, “Deprivation of citizenship”; Immigration, Asylum and Nationality Act 2006, § 56 (Gr. Brit.). “Powers to stop British jihadists returning to the UK – PM,” BBC, November 14, 2014, http://www.bbc.com/news/uk-politics-30041923; Jarvis and Lister, Anti-terrorism, Citizenship and Security; Christian Joppke, “Terror and the loss of citizenship,” Citizenship Studies 20, no. 6-7 (2016): 728-48. Home Office, Border Force, UK Visas and Immigration, and Rt. Hon James Brokenshire MP, “Immigration Bill becomes law,” Gov.uk News, May 14, 2014, https://www.gov.uk/government/news/immigration-bill-becomes-law. The Immigration Act 2014 inserts specific language into the British Nationality Act 1981, specifically in section 40, “Deprivation of citizenship”; Immigration Act 2014, § 66 (Gr. Brit.). Immigration Act 2014, § 66 (Gr. Brit.). Home Office, “Immigration Bill, Fact Sheet: Deprivation of Citizenship (clause 60),” Gov.uk, January 2014. Bennhold, “Britain Expands Power to Strip Citizenship From Terrorism Suspects”; David Barrett, “Theresa May cancels family’s citizenship,” The Telegraph, December 7, 2014, http://www.telegraph.co.uk/news/uknews/law-and-order/11278517/Theresa-May-cancels-familys-British-citizenship.html; Bobbie Mills, “Citizenship deprivation: How Britain took the lead on dismantling citizenship,” European Network on Statelessness, March 3, 2016, http://www.statelessness.eu/blog/citizenship-deprivation-how-britain-took-lead-dismantling-citizenship. Helena Wray, “The new powers of deprivation of citizenship in the UK” (Florence, Italy: European Union Democracy Observatory on Citizenship, 2014). Jarvis and Lister, Anti-terrorism, Citizenship and Security. Counter-Terrorism and Security Act 2015 (Gr. Brit.). Mills, “Citizenship deprivation: How Britain took the lead on dismantling citizenship”; Tufyal Choudhury, “The radicalisation of citizenship revocation,” Critical Social Policy 37, no. 2 (2017): 225-44. UK Visas and Immigration Home Office, “Citizenship Revocation Cases 2006-2016,” Freedom of Information Request (FOI 38893), 2016. Daniel Byman and Jeremy Shapiro, Be Afraid. Be A Little Afraid: The threat of Terrorism from Western Foreign Fighters in Syria and Iraq (Washington, DC: The Brookings Institution, 2014); Lizzie Dearden, “Swedish city to offer returning ISIS fighters housing and benefits in reintegration programme,” October 20, 2016, The Independent, http://www.independent.co.uk/news/world/europe/sweden-isis-fighters-city-lund-returning-jihadis-housing-job-education-benefits-reintegration-a7371266.html; Hamed el-Said and Richard Barrett, “Enhancing the Understanding of the Foreign Terrorist Fighters Phenomenon in Syria” (New York: UN Counter-Terrorism Centre, 2017); Alastair Reed and Johanna Pohl, “Tackling the surge of returning foreign fighters,” July 14, 2017, NATO Review Magazine, https://www.nato.int/docu/review/2017/Also-in-2017/daesh-tackling-surge-returning-foreign-fighters-prevention-denmark-rehabilitation-programmes/EN/index.htm; Robin Wright, “ISIS Jihadis have returned home by the thousands,” The New Yorker, October 23, 2017, https://www.newyorker.com/news/news-desk/isis-jihadis-have-returned-home-by-the-thousands. Byman and Shapiro, Be Afraid. Be A Little Afraid. “Do social media threaten democracy?” The Economist, November 4, 2017, https://www.economist.com/news/leaders/21730871-facebook-google-and-twitter-were-supposed-save-politics-good-information-drove-out; Douglas Heaven, “The uncertain future of democracy,” BBC, March 30, 2017, http://www.bbc.com/future/story/20170330-the-uncertain-future-of-democracy. “‘A Canadian Is a Canadian’: Liberal Leader Says Terrorists Should Keep Their Citizenship,” Vice News, September 28, 2015, https://news.vice.com/article/a-canadian-is-a-canadian-liberal-leader-says-terrorists-should-keep-their-citizenship.